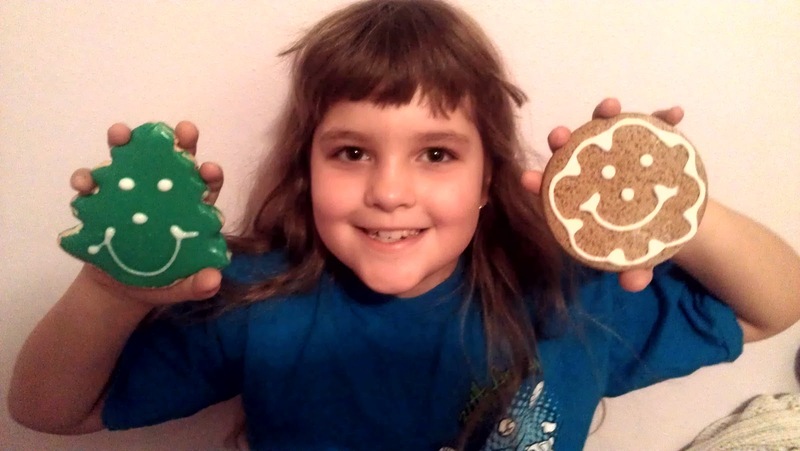 Being Frugal and Making It Work: Gingerbread Christmas Cookies - Put a Smile on Santa's Face! Gingerbread Christmas Cookies - Put a Smile on Santa's Face! Christmas is just three weeks away and many of you are still trying to find the perfect gift for everyone on your gift list. We all have one person on our list that either has everything or doesn't want anything, right? Why not give them the gift of a smile? Everyone can use a cheerful smile to brighten their day. 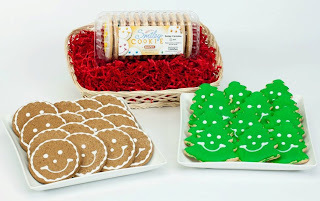 Smiley Cookie offers a wide variety of Christmas cookies, customized cookies, and cookie gifts! I can easily guarantee that these adorable cookies will put a smile on the face of anyone who receives them - young or old! You should have seen the faces of my children light up when I showed them the adorably festive Christmas cookies that recently arrived at our house. We were sent a dozen holiday cookies; 6 green Christmas trees and 6 smiley gingerbread cookies! Just the smell of the gingerbread cookies is enough to make your mouth water! They could hardly wait to eat them. They also couldn't stop talking about how cute they were. I would have to agree! Not only were the cute, but they were delicious. The cookies themselves were soft and buttery. The frosting just a little bit crunchy. The perfect combination! Smiley Cookies are baked fresh and frosted by hand daily with only the finest ingredients. The smiles come in a variety of colors - yellow, blue, purple, orange, green. You can even order customized cookies to match your school team colors, your wedding colors or business logo. Smileycookie.com also features Hanukkah and Christmas gift baskets, individually wrapped, nut free Christmas cookies that are under 100 calories and perfect for sharing with larger groups at schools, offices and Christmas parties and stocking stuffer cookies! Starting at just $12.99, they have the perfect cookie for everyone and every occasion! Weddings, Birthdays, Thinking of You, New Baby, Graduation, I Love You, I'm Sorry, I Miss You, Just Because and so much more. Smiley Cookies make the perfect party favors for weddings, graduations and baby showers! Smiley Cookie also offers a smile proof guarantee - if their cookie gifts don’t make you smile for any reason, they’ll be happy to refund or replace them — guaranteed!!! Use the coupon code "BLOG10" at checkout to get 10% of any of their Christmas cookie gifts! What is your favorite type of Christmas cookie? I received a dozen of Christmas cookies mentioned above for free using Tomoson.com. Regardless, I only recommend products or services I use personally and believe will be good for my readers.